ASK THE EXPERTS: THE MYSTERIOUS BLUE WATERMELON - What About Watermelon? DEE ASKS: Probably twenty years ago, my uncle used to drive to the southern heel of Missouri and into Arkansas to purchase vegetables and fruit to bring back to mid-Missouri and sell. On one of his trips, he brought back an unusual watermelon to show his friends and family. The melon had seeds, but the flesh of the watermelon was blue. Has anyone else heard of this blue fleshed watermelon? We have been trying to find another one in recent years, but everyone we ask in that area says they’ve never heard of them. As soon as I read your question, Dee, I was immediately consumed by an urge to track down this mysterious blue watermelon. I personally have never heard of a blue watermelon (I’ve seen yellow watermelons), so I asked some of my watermelon farming friends about it. Much to my dismay, they had never heard of it either. Then I went online to try to track down the elusive watermelon and could only find the photo on the right of what looks like a very blue watermelon, but I think the picture might be the result of editing magic. (As you pointed out in a follow-up to my answer, it’s too much of a coincidence that the watermelon matches the cabinets and everything else in the picture has sort of a bluish tint.) 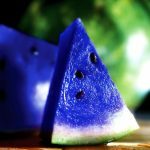 It might be possible to create a blue watermelon using dye, but at this point, I don’t think it’s possible to grow a blue watermelon naturally. And so, the mystery remains unsolved… for now. Would be nice if somewhere a blue watermelon was found. What would it taste like I wonder? Hope the mystery is solved eventually. I bought some seeds for blue watermelons. I have 4 on the vine as of now. Can’t say if they are blue yet. I agree, Ellen. The discovery of a blue watermelon would be a momentous occasion for watermelon lovers like us. So momentous, that I’m willing to offer a reward to the first person to step forward with physical proof of a blue fleshed watermelon. The reward will be (checking my pockets)… Three dollars and 78 cents! As for the taste, I imagine it tastes something like real watermelon with a hint of sweet blueberries. Hey, a guy can dream, right? You can see the red of the watermelon in the reflection of the large wedge on the far right. The editor changed the reflection on the butchers knife to be blue, but on the counter top next to it the reflection is red. Excellent observation, Reflection!! I pasted the photo into my trusty Microsoft Paint program and enlarged it to get a better look and you’re right! Also, even without enlarging the photo, you can see pinkish reflections in the white bowl that the editor overlooked when he or she changed the color of the watermelon. I think if you water a watermelon plant with water with blue dye for a long period of time, it will turn blue. Only a suggestion… Not sure if it actually works. I saw online that they grow blue watermelons, \moon melons\ in some parts of japan & cost at least $200 USD. It is a moon melon, found in parts of Japan, and is around $200.00 or more! While searching the internet for photos, I found the real image of the milon, and it is red not blue. If there is such a thing as blue watermelon it’s probably scientifically modified. Dear “rare exotic fruit exprert”, please get me some more info on these blue watermelons! “rare exotic fruit exprert”, et. al. – the blue ‘moon melon’ is a debunked myth. It doesn’t exist. Please do some research before making outrageous claims. There is no such thing as a moon melon, guys. It’s just a hoax. How does a watermelon stay fresh or normal uncut and from the garden? or how many days do i need to keep it – out of a fringe and remains edible? I know it’s a hoax, i was hoping to see what the “rare exotic fruit exprert” would present as evidence. Look closely to the reflection of the watermelon in the knife. This is clearly an edited photo, the reflection of the watermelon in the knife is clearly red. Well, I am going to prove that there are such things as blue watermelons. I just received via EBay , seeds to grow blue watermelons. Wish me luck!!! Good luck growing your blue watermelons, Kelli! Be sure to check back in with us here on the blog to let us know how it’s going for you! We’d love to see some photos. How did your Blue watermelon and strawberries turn out Kelli and Tammy..?..? Maybe no follow up comment suggests the obvious…?…? Safe me the time and money here. How did the growing go? 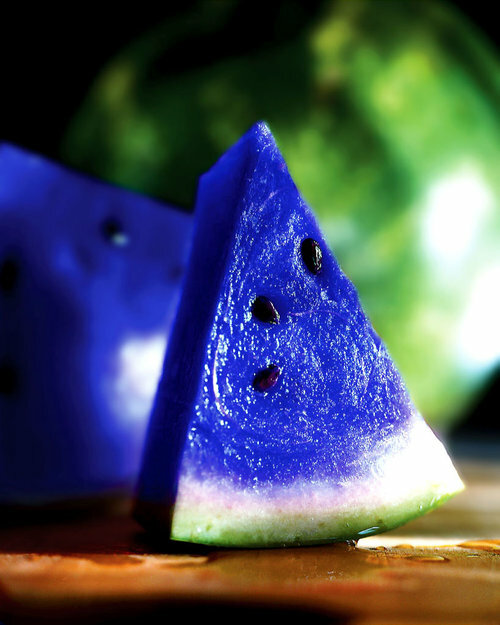 There is such a thing as blue watermelon. Also purple,green,yellow and orange. I am growing blue,purple and green meated watermelons this year.Is there’s any way I can add a picture to this message. Because I have pictures.